Thank you for reading this blog entry! This is the last post on the blog tour. If you have only just joined the tour, welcome, you have only just made it! If you have read every post, thank you for following the tour! Two days ago, I talked about the poems in Forever Friends and how some of the poems express feelings of friendship through music and nature. 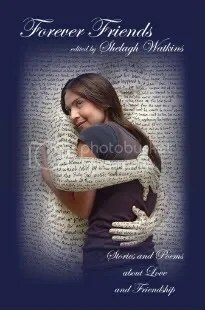 Last week, I mentioned that the poems in the book celebrate friendship in all its facets from loving to detached, giving a few glimpses of the other side of friendship, while others are thankful and show gratitude for the kindness of friendships and the loyalty of true friends. Dana Rettig’s poem, Gratitude is one of a number of poems in the anthology that focus on the value of friends for their help and support. There are times in everyone’s life when they lose the motivation to continue doing something that seems impossible to achieve. If all hope seems to be gone, encouragement from a friend can make all the difference between success and failure. Dana’s poem is about the special kind of friendships that give us strength and for which we are eternally grateful. I would like to thank Dana for inviting me to her blog to give me a chance say more about the poems in the anthology. Although this is the last blog on the original tour, I will be visiting Elynne Chaplik-Aleskow’s blog tomorrow when I will be answering some in depth questions about anthologies in general and Forever Friends in particular. Do not miss it! Thank you for reading this blog entry! This is the eighteenth post on the blog tour. If you have only just joined the tour, welcome! If you are still with us, thank you for following the tour! This is the penultimate blog on the virtual book tour. Yesterday, I talked about the variety of poems in Forever Friends and today I will be talking about the non-fiction stories in the anthology. Real friendships are made every day along with new relationships of love or companionship. At the same time, friendships are broken and friends are lost in one way or another. The true stories in Forever Friends reflect all these different states of friendship and human relationships. You will find true stories about family relationships, old school friends, ex-lovers, new acquaintances and even family pets. Yvonne Oot’s short story, Timeless Friendships is a true story about the music industry. After travelling the world, Yvonne finally chose to settle in Nashville, Tennessee, the home of country music. Starting her writing career with Interstate 40 Country Music Magazine, she has met and worked with some of country music’s finest legends. Keeping her promise to Merle Kilgore just prior to his death in 2005, Yvonne currently writes for Up Country Magazine in the UK. Her short story in the anthology is a tribute to Merle Kilgore and Jim Ames, who mentored Yvonne and followed her career until their own deaths. I would like to thank Yvonne for inviting me to her blog to give me a chance say more about the true stories in the anthology. Thank you for reading this blog entry! This is the seventeenth post on the blog tour. If you have only just joined the tour, welcome, there is a lot for you to catch up on! If you are into the third week of this virtual journey, thank you for following the tour! Last week I talked about the variety of poems in Forever Friends and how some of the poems express feelings of friendship through music and nature. Poetry lends itself readily to the interpretation of sounds and sights found in our everyday surroundings, whether it be in town or in the countryside. Poetic, lilting words that flow across the page convey thoughts readers can feel inside as they pick up the gentle rhythm and tempo of a poem. Within the pages of the anthology, you will find poems that demonstrate the importance of friendship and the special relationship that can develop between humans, animals and even musical instruments. Tiziana Rinaldi Castro’s poem, Ah, What a Relief has a musical rhythm that gives a clue to the meaning of the poem. At first reading, it may not be apparent to the reader that the poem is about the relationship between a musician and a musical instrument. The cadence of the words, however, induce the sound of notes in the air being played, informing the reader that a wind instrument is the friend of the poet and that the friendship is renewed each day afresh. The perfect combination of poetry and music! I would like to thank Tiziana for inviting me to her blog to give me a chance say more about the poems in the anthology. Thank you for reading this blog entry! This is the sixteenth post on the blog tour. If you have just joined the tour, welcome! If you read all the blogs, thank you for following the tour; only three more blog posts to go! A week ago I mentioned the last section “Spiritual Friends” in the anthology Forever Friends. In the opening section “Family Friends” the first story in the book is My Hero, My Dad by D. J. Stephens. I chose this story because it was the first submission I received and in all the rearrangements I made it always stayed the first story in the book, so it seemed to be the right place for Don Stephens’s story. The last short story in the anthology is The Night of the Gift by Grace Bridges. I placed this last in the book because it seemed to sum up the way that friends are always in our thoughts no matter how far away and provided an ideal ending to the volume of short stories and poems about love and friendship. Just as the first story always remained first after every reshuffle, The Night of the Gift always remained last so, again, this seemed to be the right place for Grace Bridges’s story. The Night of the Gift is set in a remote village in Southern Russia, where a young doctor is feeling homesick for Ireland. In a sleepless reverie, she imagines that a childhood friend, who is supposed to be far away in Brazil, pays an unexpected call … but is it in her imagination or is it real? Read the story to find out more about this supernatural flight of fancy. I would like to thank Grace for inviting me to her blog to give me a chance say more about Forever Friends. Thank you for reading this blog entry! This is the fifteenth post on the blog tour. If you are new to the tour, you are a little late but welcome anyway! If you have been around since week one, thank you for following the tour! This is the first day of the last week of the tour and most aspects of Forever Friends have already been discussed. Last week, Malcolm Campbell asked how the theme for the anthology was chosen and I said that friendship seemed to be an obvious choice because of the friendships on the forum. However, I did not mention the theme of love that also runs through the poems and short stories. Poetry and love seem almost synonymous and no anthology with poems included would be complete without a few verses of love. Short stories too lend themselves to love and romance. One of the stories, in the section, Romantic Friends, is Noble Heart by Karina Kantas. Karina’s story was slightly longer than the four thousand words maximum that I asked for originally; in fact, it was twice as long! To make the story fit into the anthology in keeping with all the other short stories, I decided to split Noble Heart into two parts. In Part I, Karina relates a tale of woe in bygone times, when a damsel in distress is found wandering around lost and abandoned. A noble lord rescues the fair maiden but, when left alone with his jealous younger brother, she is forced to escape the arrogant young man’s unwanted advances. In Part II, a bitter row between the two brothers ensues and has to be resolved as the young woman seeks to learn more about her lost identity in the hope of finding true happiness. Karina is a fine storyteller and this story will delight all lovers of historical romance. I would like to thank Karina for inviting me to her blog to say a little more about Forever Friends. Still time to buy the book before Christmas!